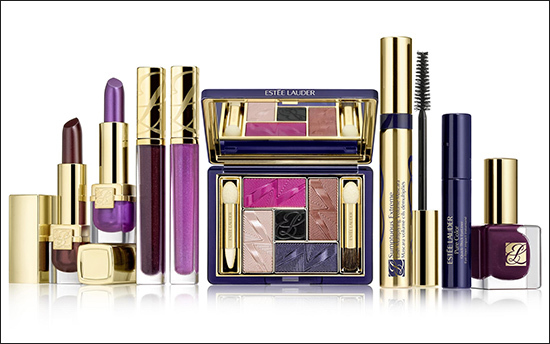 The limited edition Estee Lauder Pure Color Violet Underground is the newest Fall 2012 makeup collection that many people are raving about. If you love all the shades of purple, this is one you gotta have. I absolutely love the colors since they are so vibrant and great for this fall season. Violet is sooo in for fall 2012, especially with Estee Lauder! Check out what the reps at Estee Lauder had to say about the collection and what's inside the entire limited edition collection. "Introducing a new multi-dimensional, limited edition trend collection for 2012, Estée Lauder Pure Color Violet Underground. Inspired by multiple cultures, styles and textures, this collection is the ultimate fusion of high style and street chic. The makeup in Pure Color Violet Underground takes glam rock to a new dimension with a fantastical aesthetic revolution of deep, vibrant violet and fuchsia tones. Estée Lauder translates the drama of underground style fused with the luxury of couture onto eyes and lips saturated in a jewel-toned palette. Cognac and bordeaux combined with neon brights in scarlet and crimson create a mysterious palette rich in sensuality. Pure Color Violet Underground uses contrasting high lacquered intensified pigments and matte hues to create rich dramatic dimension. Together the strong pigments collide against a beautifully radiant satin complexion to give the overall look a modern yet dramatic high-fashion feel that any woman can try." Are you excited to get your hands on this collection? Let me know!